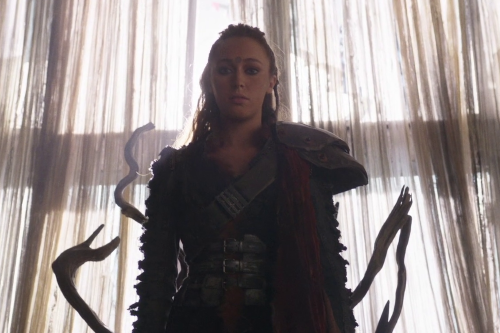 Last season, Alycia Debnam-Carey first appeared on The 100 by hiding Lexa's identity from Jaha and Kane while they were imprisoned by the Grounders. From that moment through Lexa's betrayal of Clarke at Mount Weather, Debnam-Carey has become a fan favorite on the show, especially by those who would like to see Clarke and Lexa become a romantic item again (aka Clexa fans). Given Debnam-Carey's starring role on Fear the Walking Dead, there's been some concern about how many episodes she'd be available to appear in during The 100 Season 3. Last week at the Television Critics Association (TCA) Press Tour, I spoke with Executive Producer Jason Rothenberg and asked him about how many episodes she would appear. He didn't provide an exact episode count, but did offer some insight into how much Lexa will play into the upcoming season. "I think she did as many for us this season-- or has done as many for us this season as she did last season," Rothenberg said. "I talked to AMC a lot about-- begged on hands and knees, 'Please let us use her. The character is amazing and she has totally taken off as an internet sensation.' I'm really grateful they let her come hang out with us today [at TCA]." According to IMDB, Debnam-Carey appeared in nine episodes during The 100 Season 2. If she's in close to that number this season, fans shouldn't fear at all. Her commitment to Fear the Walking Dead hasn't prevented her from being a force on The 100. Now the question is .... Will Clarke be able to forgive Lexa? In a previously published interview, Eliza Taylor (Clarke) stated, "I'll be seeing [Lexa] but it's not gonna be fun for Clarke at all. She's really torn up about it. She loved Lexa and she was betrayed. It's going to be a really shaky reunion." One thing that's sure is that it will be a wild ride! Tune in to watch The 100 Season 3 premiere, "Wanheda: Part 1," live Thursday, January 21 at 9 pm ET on the CW.